Community preparedness is the community-wide effort to provide citizens and residents with the information, training, and resources they need to prepare in advance of a disaster or crisis that may affect the region they live in. 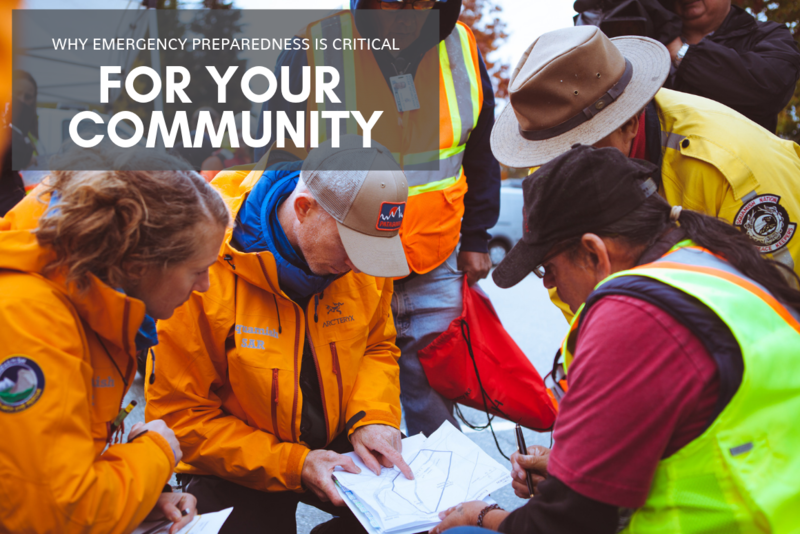 Preparing your community for an emergency is a collaborative effort between residents, emergency management teams, local authorities, and governments. Here’s why emergency preparedness is critical for your community. When we take into consideration how many people in our community may not be prepared for an emergency, we can start to understand the strain this is likely to put on community resources, and first responders. By preparing together, we can highlight gaps in emergency preparedness and take steps to change that, so we can support one another and relieve some of the pressure that’s placed on community groups in a time of need. We rely on emergency services, like Emergency Managers, Firefighters, Police, and Paramedics, and other groups, like Search & Rescue Teams, to support our communities in a crisis. When an emergency is isolated or more “routine”, first responders are able to distribute their services effectively; however, when a disaster is more widespread (think about earthquakes or wildfires), resources are stretched and it’s not always possible for the quick responses we’re accustomed to. In a widespread disaster, there’s an increased need for all emergency services, and by preparing our communities for a variety of crises, we can self-support in situations that might not require a firefighter or a police officer. For example, by preparing your family with 72-hours’ worth of food and water supplies, you can safely wait for local authorities to reach you once they’ve attended to those requiring immediate attention following a disaster. Many Emergency Management Teams rely on residents volunteering their skills and time. While many volunteers have skill sets they have learned elsewhere (First Aid, Search & Rescue, CPR), ensuring that a community has an established team takes time and effort to put together. By preparing ahead of a disaster, teams have a chance to assemble themselves efficiently, and outline the role that each team member will play. It also provides more time to have regular meetings to stay up-to-date on needs, skills, resources, and tools, and to have regular practice drills so that the team is cohesive and confident with one another. Regional Risks Impact Communities Too! You might be familiar with the general risks of your region, whether you live in an area that experiences severe snowstorms in the winter months, or sees heavy rainfall and flooding in the spring, but understanding how they may impact your community as a whole is key. Based on the common hazards, what emergency plans are in place? Where are emergency shelters located in the community? What and where are our evacuation routes? Are there dedicated resident meeting places throughout the community? You might even want to check out organizations that already exist and support communities across the continent – not only have they identified community needs, but they have the expertise to provide solutions, and that means you don’t need to reinvent the wheel! Some examples include Citizen Corps Councils, Community Emergency Response Teams (CERT), Neighbourhood Watch Teams, the Red Cross, or even your local Search & Rescue Group. Setting goals makes everyone accountable, and the same goes for your community at large. Clear goals establish your emergency preparedness efforts, and let everyone know what part they will play in the process. Goals also help you keep track of your progress and let you know when you’ve achieved something! You can start by encouraging your community and residents to get involved in Emergency Preparedness Week (Canada – first full week of May), National Preparedness Month (United States – September), and The Great ShakeOut (October).